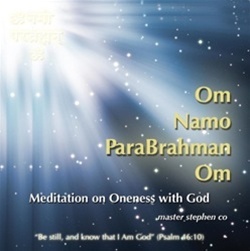 Meditation on Oneness with God By Master Stephen Co Powerful New CD from Master Co! He first takes you through deep energetic cleansing of the chakras and the auras. He then guides you through an intense and loving meditation to Experience Oneness with your Higher Self then Ascend to Cosmic Spiritual Heights to Become One with the Solar Logos and ultimately One with God and One with All! Many have experienced Oneness with the Cosmos during this powerful meditation! Create a Sacred Inner Spiritual Space with this meditation! ~ Experience almost instantaneous stillness! ~ Feeling of Going Home and being One with All! This meditation can also be downloaded for only $9 USD. This purchase, will send you an email with a link to your download. The link is valid for only 48 hours and for 2 attempt downloads. To purchase DOWNLOAD ONLY click "Add to Cart" Button. Me and my friend love listening to this meditation. Feel the bliss of going to high spiritual hights!